Should I Buy Remy Lace Front Wigs? "Should I buy remy lace front wigs?" Strictly speaking there is at least one more kind of non-remy hair. Back to the question: Should you buy remy lace front wigs? Should non-remy lace front wigs be avoided? Most human hair on the market isn’t 100% remy – it’s typically a mixture of both remy and non-remy (but that’s a whole other article). There are plenty of lace front wigs with all the different lace cap wig constructions (such as silk top (hidden knots) and V-lace front wigs) available from many retailers. Non-remy lace front wigs are available in the exact same textures as remy lace wigs. Non-remy hair wigs require the same fundamentals of wig care but with the addition of silicone based styling products in order to ensure that the hair retains the appearance of having lustre and sheen. Non-remy hair wigs won't dye very well (due to the lack of cuticles) and if you buy a non-cuticle non-remy dyed lace wig then the colour is likely to fade more quickly than it would on a 100% remy hair lace wig. 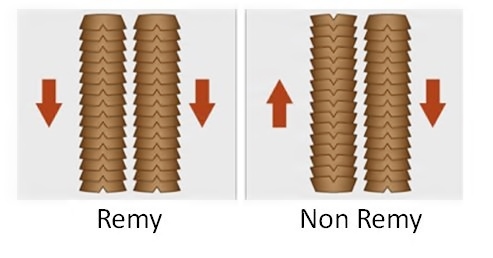 Not all non-remy hair ends up being severely tangled – there are brands of non-remy hair suppliers which clearly set out that the hair doesn’t have cuticles which is why it won’t be prone to excessive tangling (there aren't any cuticles to catch on each other). Non-remy hair is usually (not always) more affordable than 100% remy hair wigs. Once you've decided how important the above factors are, then you'll be able to decide whether the best type of hair for you is a 100% remy or a non-remy hair wig. Okeydokey, that's the ride through whether or not to buy remy lace front wigs. There's more information in the Lace Wig Q&A section or if you'd like to be first to read new guides and articles about lace wigs, hair extensions and hairpieces, join our blog - it's super easy to do and doesn't require any personal info!